Removal of attributes was also mentioned, but the idea is still in quite an early stage. It’s something [CCP Games’ devs] want to do as it’s on the level as learning skills, so that people don’t have to get locked into training skills in a non-optimal order for use, in order to train at the optimal speed. There is still some discussion around what would possibly be done with learning implants (keep them, flat bonus, something else). There are also questions as to what the rate would be with the changes. Ali [Aras] brought up some feedback that some veteran players like the space it gives you to optimize your character, but overall supports removing attributes. There was also the point of learning implants [as a] disincentive [to] PVP, especially in null and WH. 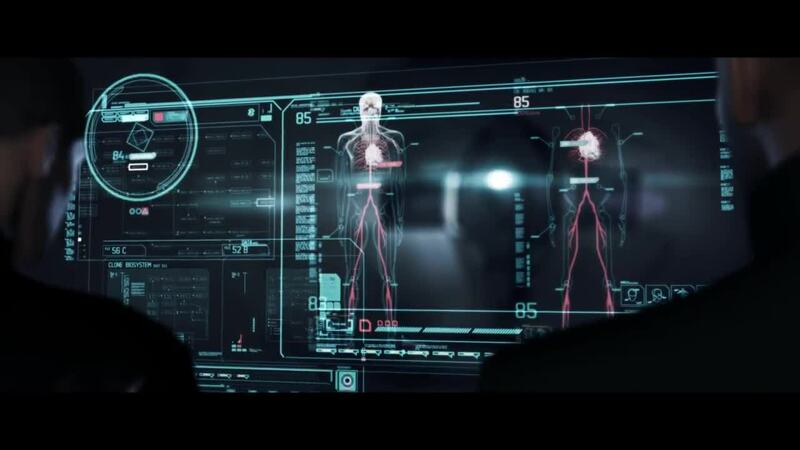 New players in EVE Online are often confused by character attributes, and what they mean. I know this because one of the most popular guides that I wrote on my personal blog (click here to read guide) is about remapping attributes effectively. More than a year old, this guide continues to get hundreds of views every week. It’s clear that attributes are one of the little features in EVE Online that are not well understood. Intelligence – the speed at which you process information. Memory – how well you remember information. Charisma – the degree to which you influence others. Perception – your ability to understand the situation around you. Willpower – the amount of stamina you have to reach a goal. To see your attribute scores, click on your Character sheet button on the NeoCom, then click on Attributes. Practically, your character’s attributes affect no other game mechanic other than determining the speed at which a character can train skills. Each skill is associated with one primary and one secondary attribute. The formula for the speed of skill training (in skill points per minute) is: (SkillPointsNeeded – CurrentSkillPoints) / (PrimaryAttribute + (SecondaryAttribute / 2)) In short, your assigned score for a skill’s primary attribute will affect training time twice as much as your score for a secondary attribute. Therefore, in order to maximize the rate at which characters learn certain sets of skills, players must adjust their attributes from time to time. CCP Games allows this to happen with a process called neural remapping, but the number of remaps you can do is very limited – generally, twice in your first year of play, and only once a year thereafter. As a result, remaps should not be done without careful consideration—and this is why my blog guide remains popular. The CSM’s discussion on the removal of character attributes is part of a general trend towards simplification of game mechanics in EVE Online that are needlessly complex, or that add little to the game playing experience. For example, the industry revamp in the Crius release made use of industry much easier—and CCP made this even simpler by later removing the concept of Teams, a little used feature that did not add a lot of value. As referenced by the CSM in the 2010 Incursion release, CCP eliminated “learning skills” from the game (read the Wiki on this here). These skills had allowed players to increase attribute scores, and thereby reduce training time, but they also required players to delay training in more practical (and more fun) skills in the game, and therefore were seen mostly as a painful “rite of passage” that no one enjoyed. There were few complaints from the player community when learning skills were removed from the game. Today, players may boost their character attributes only by installing various grades of Attribute Enhancer (“learning”) implants, one for each attribute. However, as pointed out by the CSM, learning implants, especially the maximum +5 attribute increasing versions, can be expensive—generally more than 100 million ISK each—and this creates a disincentive for players who use them to participate in dangerous activities. No one wants to lose a half-billion ISK of value from their implants, should they get podded. Also mentioned in the CSM meeting minutes was the fact that attributes require players to learn certain batches of skills in a particular sequence, if they wish to minimize the time to learn those skills. This is because each skill is associated with two attributes. This puts players in the position of forgoing the training of skills that have more immediate application, in order to optimize training time over the long term, thereby limiting their current gameplay choices—similar to the problem with learning skills. Finally, there is the matter of neural remaps, which if done poorly, can result in significant delays in developing certain sets of skills, and thereby reduce the degree of choice among different types of game-play. Based on the questions I receive from players who read my advisory guide, the frequency of making bad choices in a neural remap is unfortunately all too common. Making good decisions about a neural remap—determining the optimum time and point levels—generally requires using a third-party application such as EVEMon, to calculate the variables correctly. Since the supply of remaps is very limited for each character—just one a year—the implications of less-than-optimal choices are potentially severe. 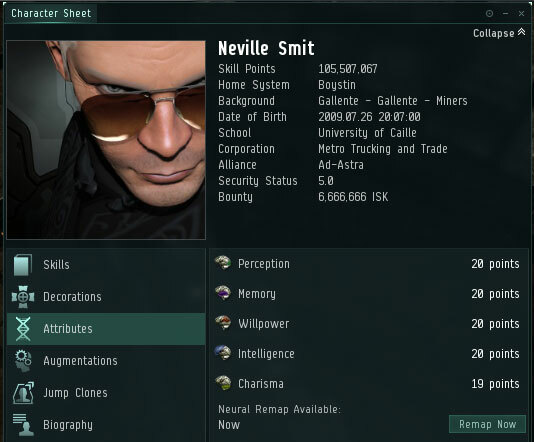 If CCP ultimately does do away with character attributes, how would game mechanics change? All skill choices are equal—in an attribute-free EVE Online, all skills would become equally accessible. There would be neither need to plan for maximum training rates, nor optimizing training sequences. There would be no artificial “right” choices, other than what kinds of activities a player wants to pursue in the game. Elimination of attributes would provide more freedom in selecting different skills to train. Standard training rates and implant bonuses—without attributes, it is likely that CCP would set a universal rate for skill points accumulated. This would likely be a flat rate, perhaps modifiable by flat (and low) percentage bonuses from up to five learning implants. Different skills would require more skill points to learn than others, just as we have now, and higher-level skills would take longer to achieve, but everyone would learn them at the same rate. The decline of training apps?—skill-training planning applications, such as EVEHQ or EVEMon, will become less useful in an attribute-free EVE Online. The need to train certain prerequisites to unlock access to ships, modules and other abilities would remain, but players can use the in-game ISIS ship-browsing utility to determine which skills to train, and in what sequence. Adding the ability to stack up skills in the training queue, even if the prerequisite skills have not yet been trained, would further reduce player dependence to play “what if” with different training paths in third-party applications. Goodbye, remaps—with the removal of attributes, there would no longer be any need for neural remaps, the risk of doing them poorly would simply go away. I will have to write another guide soon, if I want to keep my blog traffic at the previous level of popularity. Altogether, the elimination of attributes would simplify EVE Online’s skill training and character development mechanics, and make it easier for new players to train the areas of the game in which they have an immediate interest. Simplicity, improved accessibility, more choices in gameplay, and greater ease of use make it highly likely that CCP will delete attributes sooner rather than later. While some “bittervets” like me, who had to master a more complex system, may complain that youngsters in New Eden have it all too easy compared to what we had to endure, we have to agree that attributes do little but make EVE Online more complicated—and they aren’t really very much fun. Like the “learning” skills, attributes won’t be missed very much once they are gone.